All customers go through a journey as they interact with your brand. If you graph these experiences on a timeline, you get a user journey map. 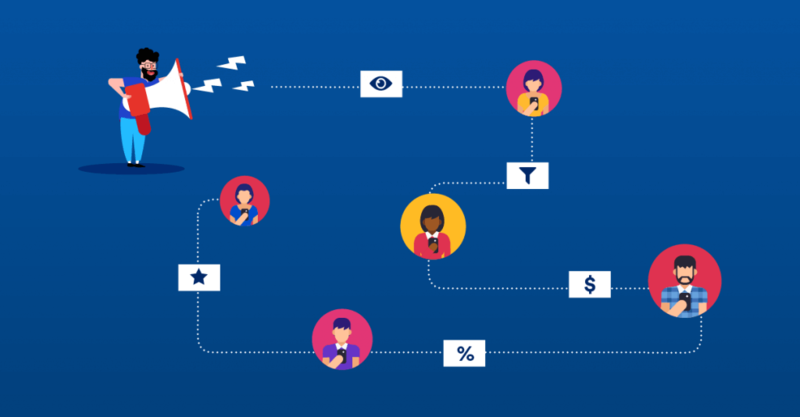 Another way to describe the journey is by calling it the customer lifecycle, where a user passes through various stages on the path from prospect to superfan. By focusing not just on customer personas but also on what stage a user is in, you can target your marketing campaigns more finely and hone the message to hit exact pain points. This is the essence of lifecycle marketing: communicate at every stage with relevant offers or support, and make them actively use your app. But first, let’s define those stages. There are various progressive steps (or stages) a customer goes through – from researching to purchasing, from light engagement to loyal use. These customer lifecycle stages outline how a person starts out as a potential user who first learns about your app. They share some personal information that allows you to market to them. They purchase your app or service and continue to use it. They ideally become so enamored with your brand that they influence others in their networks to try out your app. Below, we go through each stage in detail as well as lay out tactics you can use in your customer lifecycle management. Reach is about building awareness and getting in front of prospective customers. This is the beginning of any customer journey. Social media, paid ads, and word-of-mouth provide the initial boost that brings you to the attention of a user. But then there are many other avenues to gain a better understanding of a product or service. Use the channels that your prospective customers are on. Get the word out! In this stage, it is crucial to invest in an omnichannel marketing strategy. You want to capture potential customers no matter what channel they come in on. But at the same time, provide them with a seamless experience of your brand. You’ve got to reach out to prospects and find them where they congregate. This means everything from display ads and social media ads to influencer marketing and even guest blog posts. This is also the stage where a solid content marketing strategy comes into play. Provide shareable content that people will want to spread: infographics, quotes, stories, bite-sized videos. This content is for the top of your funnel. Plan (and hope) for virality in your marketing campaigns. But always in the service of creating materials that are useful to your prospects and that answer their questions. Focus also on building website traffic as well as strengthening organic SEO so you can be found on search engine pages. Acquisition is all about attracting those prospective customers and getting them into the sales and marketing funnel so they can be nurtured to the next step: conversion. At this step, it’s about giving them the information they need to make a buying decision. So, blog posts, whitepapers, ebooks, templates, webinars, and anything else that solves a pain point for your customers. In order for you to market effectively in these first two customer lifecycle stages, you need to set up compelling lead magnets and landing pages that offer valuable content to users in exchange for their information. This exchange is what triggers the formal start of lifecycle marketing. Typical offers include: downloads of ebooks, reports, and subscription to your email newsletters. And to support those landing pages, it’s integral to have a solid email marketing strategy that you can refine and improve using analytics. The emails are there to drive people to your website and your app. Conversion is the stage where you’re convincing the customer to purchase. These prospects are already in your funnel and are receiving your nurture emails, your blog posts, even your in-app notifications and push notifications. Your prospects will be reading reviews of your app or service. Make an effort to incentivize your loyal fans so they leave reviews in app stores or other marketplaces. At this stage also, your content marketing strategies should be comparison-based to prove your value: How does using my app differ with the competition’s app? In a product shootout with 4 other competitors’ apps, how does my app excel? If you want to market to users at this lifecycle stage, you need to have a fully fleshed-out support team and a knowledge base that can assist and answer any of your prospects’ questions. This is the stage where you want to keep the customers you already have and upsell to them. Your customers have purchased from you and are using your app. Your main concern is engaging them so that they use your app and services on a regular basis. 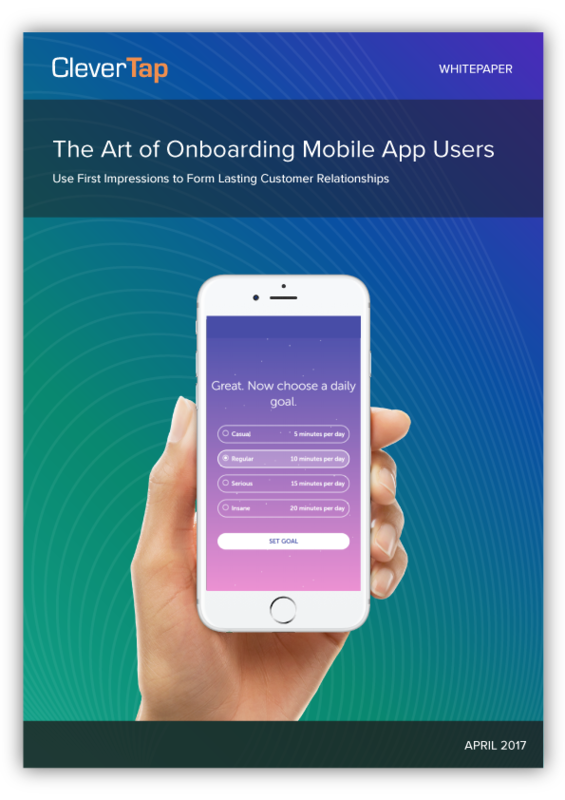 The more you can persuade users to return to your app, the better your chances at retaining them and increasing their Customer Lifetime Value. As product expert Nir Eyal says, the most successful mobile apps are habit-forming. Hooking them into your app so that they use it habitually is key to retaining your users. At this stage, you should already be concerned with turning customers into loyal users. And it all starts with an effective onboarding process. If you get them started in the right direction, you immediately show the value of your app from the beginning of the relationship. Use push notifications to establish a connection with your app users. These notifications can help users see the value of your app so they use it more regularly. Use deep linking in your notifications to drive users to specific pages or locations in your app. This tactic has been proven for user retention not just in quantifiable metrics, but also in intangible benefits such as a memorable user experience. You want to transform each paid user into a brand advocate and an influencer in their individual networks. Done correctly, your own users generate buzz via word-of-mouth marketing. Instead of you proclaiming your own app’s value, they do it for you. But before you ever get there, you need a stellar product and you have to win customers over with excellent service. Use machine learning to assist in your efforts at retaining users and making them even more loyal. Track what percentage of your customers make repeat purchases. Also, compare new buyers with repeat buyers. This is one way to measure loyalty. As in the acquisition stage, investing in an effective customer support team will pay off in the long run. They’re there to make the user experience more pleasant and to answer questions and any difficulties that users encounter. But it’s equally important to establish a relationship with loyal users. Show appreciation for their business, treat them well, and nurture that connection. If you want to use influencer marketing more effectively, then don’t just limit yourself to the obvious choices – those influencers with large networks on Twitter or LinkedIn. Remember that you have loyal advocates already in your user base who are tweeting about your service or posting photos of your product on Instagram. And they have immediate family members and friends who can be reached more easily by their influence than by any of your marketing campaigns. These loyalists are primed to promote your product to their networks. All they need is a little incentive. And don’t forget to Include your own team in this list, plus any external partners you work with. There’s a reason why organizations use a customer relationship management (CRM) tool. There are far too many channels and possible touch points where a user can engage with your brand. And it’s up to you and your reps to keep track of them. Say a user downloaded your app, used it for a few days, then uninstalled. But several win-back campaigns reignited interest and got the user to reinstall, and a sales call finally nudged them to buy. You will only be able to trace a journey like that if you keep track of every campaign and every touch point via your CRM. Connect your systems so you have one dashboard for all important metrics. Document those interactions so you have a trail of engagement. Check all those customers who have a high possibility of purchasing and market to them. 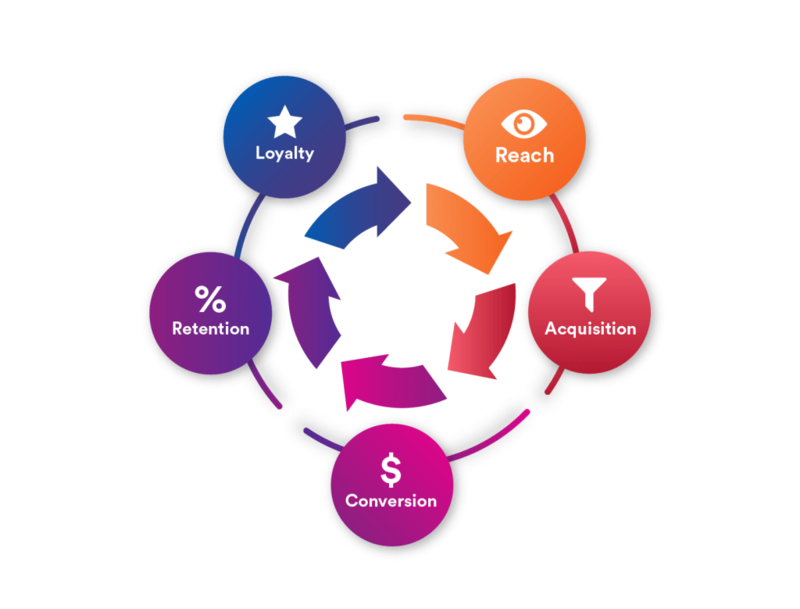 Remember that customer lifecycle marketing is an ongoing effort. It’s never linear, it’s cyclical. As users evolve from leads to paying customers, their needs change and their experience engaging with your brand undergoes a shift. If we do our jobs right as marketers, then we’re constantly trying to address those shifting needs via customer lifecycle management. At the same time, we want to keep converting our app users into paying customers with each new feature. Every new feature or product gives you a chance to upsell or cross-sell and thus increase the Customer Lifetime Value of each user. Every campaign is an opportunity to engage and retain users, bringing them closer to becoming brand advocates.